Hi, my name is Lisa, and I’m so glad you’re here because that means you have an interest in real food! Whether you’re brand new to cutting out processed food or you’re a real food veteran, I hope you’ll find some value in the resources on this blog. In the beginning of 2010 I had never before read an ingredient label, never bought anything that was organic (at least not on purpose), nor had I ever stepped foot in a farmers’ market. I am certainly not proud of those things, but that was reality for the first 32 or so years of my life and the most disturbing part is that I had no idea I was doing anything wrong. After reading In Defense of Food by Michael Pollan I got the wake up call of my life and felt like our eating habits needed a serious overhaul. Making such drastic changes was not easy at first (it has thankfully become our “new normal” since then), and at the time I struggled to find resources to help me understand exactly how I could apply Pollan’s principles to our everyday lives. So shortly thereafter my real food blog was born and a few years later my #1 New York Times Best Selling Cookbook was released. What a journey it has been! And what better way to convince others to join us on this journey than to give them all the tools they need to successfully make it happen. Good luck on your mission to cut out highly processed food. 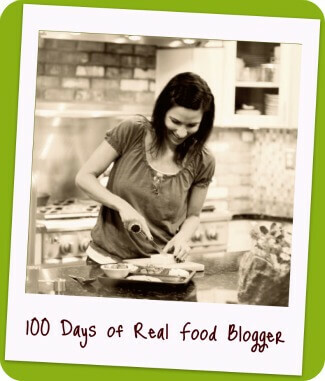 How to take our “10 Days of Real Food” pledge, which was created for the blog readers…if we followed our rules for 100 days then anyone can do it for only 10 days! I add new content to the blog weekly so be sure to subscribe via email to be informed of new posts. Wishing you the best of luck on your real food journey!